A third Thursday networking event series in Yazoo! 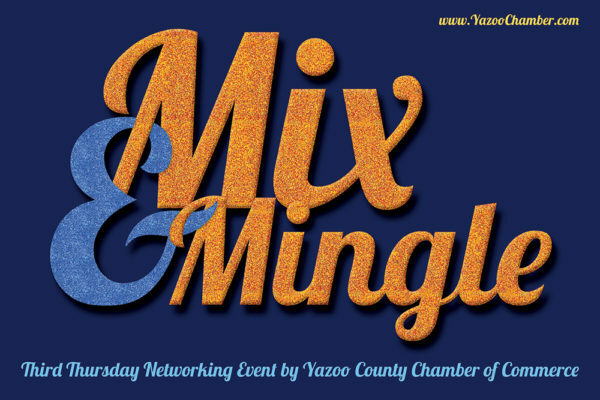 Description: The Yazoo County Chamber of Commerce proudly presents a new networking event series, “Mix & Mingle.” Chamber members and the public are welcome to attend FREE, are encouraged to bring a guest and to encourage non-members to join the Chamber. The Yazoo County Chamber of Commerce is a 501c 6 non-profit, voluntary organization of business and professional members working to encourage business growth and civic improvements that will benefit everyone in Yazoo County. This is done by promoting retail, commercial, industrial, and civic development, by encouraging economic and social growth, and by working with government at all levels to maintain a sound and progressive economy. Learn more about the Yazoo County Chamber of Commerce at www.yazoochamber.com or give us a call at 662-746-1273. If your business would like to host a future Mix & Mingle event, please contact the Chamber Director Kiristi Mills at 662-746-1273.